Frigidaireís Affinity series brings another innovative electric dryer to the market. This model offers a number of practical and helpful features, such as DrySense Technology and Express-Select Controls. Dry Sense Technology reduces the chances of wrinkles while Express-Select Controls make it fast and easy to set the drying cycle and temperature setting. 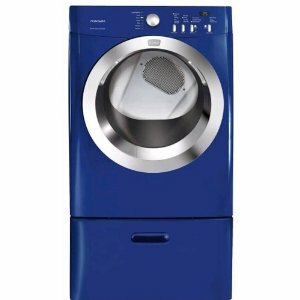 This electric dryer provides users a sufficient number of cycle options and temperature settings. Its cycle count reaches up to seven, and includes specific settings for heavy, casual, delicate, and normal loads. Thereís also a quick dry cycle that lasts only 25 minutes. Cycle Signal Lights allow you to track the progress of each cycle. Temperature settings cover a wide range of fabrics. The Sanitize option is NSF-certified, assuring users that clothes will come out 99.9 percent bacteria free. Maximum, high, medium, and low temperature settings are also available for loads consisting of common types of fabric. There are also four types of dryness level selections, ranging from normal, damp dry, to less dry or more dry. The Affinity series model includes several optional features. First there's the Precision Moisture Sensor, which automatically stops the drying process once the clothes are thoroughly dried. This prevents more wrinkles from showing up on your clothes. Thereís also a Safety Start option, perfect for households with young children. This model is available in five classic colors: blue, black, silver, red, and white. The entire structure is made of painted steel drum material while its cabinet and console come in classic white. Its Ultra-Capacity and Fits-More features provide more space for laundry, making the processí duration faster and more efficient. Users can place more than one load at a time without wasting too much energy. Express Select controls introduce the drying cycles and temperature settings to first time Frigidaire users in a quick and easy manner. Input of drying options is done without any hassle, plus thereís also the choice to save your most used settings for the net run. Cycle count covers all types of moisture, from heavy and damper loads to delicate fabrics such as underwear. Quick dry cycle is also available for clothes needed within the same day. Sanitize temperature setting is certified by the NSF and assures almost all bacteria is removed. Air Fluff or No Heat option is available for fabrics that donít require very high temperatures to dry. Reversible door feature allows the model to fit in narrow spaces. Drying cycles do not include more unique fabrics. No steam cycle option included in drying settings.